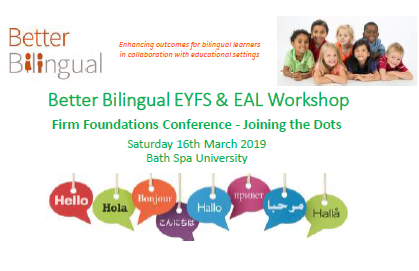 Better Bilingual was delighted to be invited to deliver workshops at the Firm Foundation Conference Joining the Dots on Saturday 16th March 2019. The workshops were really well received with a great group of practitioners attending the workshops. 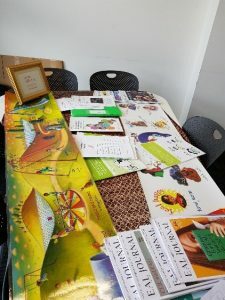 It was clear that that there was a wide range of experiences reflected in the room for both workshops. Everyone showed a high level of commitment in enhancing provision already in place for EAL learners, particularly around being secure about the starting points for EAL learners, to ensure appropriate strategies are in place to build on their linguistic and cultural experiences. 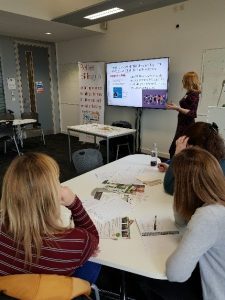 Better Bilingual is delighted to since have been invited to deliver EYFS & EAL workshops in Birmingham by Sandwell Council in June by highly committed colleagues who attended the EYFS & EAL workshop. This entry was posted in EAL, EYFS. Bookmark the permalink.